Paperwhites, Narcissus tazetta, are one of my favourite flowers to force indoors; I love their exotic scent announcing that Christmas is just around the corner. Last year, an unusual way to grow them in a mixture of alcohol (preferably gin) caught my eye somewhere in the cyberspace and this season even more bloggers seem to be spreading the message. 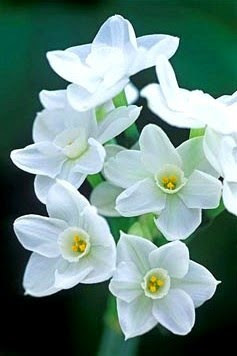 With this method, paperwhites should end up roughly a third shorter than usual. I've never heard about growing anything in alcohol, but as my paperwhites always tend to grow very tall and flop over, I thought this would be an interesting thing to try. The bulbs should be started in water, and only when roots have formed and the green shoots are 3 to 6 centimeters long, the water should be poured off and replaced with a mixture of 1 part alcohol to 7 parts water, if using 40 percent alcohol like ordinary gin. Beer and wine are not suitable, as their sugars can damage plants. Behind this method is the Flower Bulb Research Program at the Cornell University, where a study confirming the results was conducted already in 2005. More detailed instructions can be found on their web pages. Truly fascinating notion. I'm always frustrated at the leggy form of my indoor paperwhites. Hmm, Tanqueray - it's been ages since I've enjoyed the taste.